Teen terrorist begins attacking civilians outside Rami-Levy; terrorist apprehended by security guard. Two people were injured in a stabbing attack Wednesday afternoon, after a terrorist began attacking civilians at a Rami-Levy superstore in Mishor Adumim, near Ma'ale Adumim in the Jerusalem area. Magen David Adom (MDA) forces arrived at the scene shortly after the attack began at around 4:20 p.m., and gave emergency first-aid treatment to the injured. Both are men in their mid-50s and suffering from shoulder and head wounds; according to MDA spokesman Zaki Heller, at least one of the injured was an actual MDA paramedic. 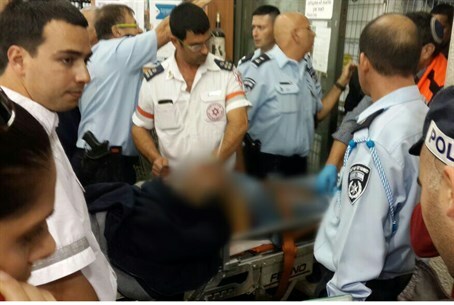 The terrorist was apprehended and has sustained light injuries after being shot by a security guard at the scene. The armed Israeli was not employed at the supermarket, which is frequented by Palestinians and Israelis, but was passing by with his weapon at the time. Police spokeswoman Luba Samri said in a statement to AFP roughly two hours after the stabbing that the alleged attacker was a 16-year-old from the Arab village of Al-Azariya, east of Jerusalem. Two additional suspects have now been arrested as well, Walla! News reports about one hour after the attack, and eyewitnesses say that the Israel Security Agency (ISA) is interrogating them at the scene. It remains unclear whether they were involved. "Near the cash registers there were two people, injured, about 50 years old, fully conscious with stab wounds in the upper body," Fadi Badarne, an MDA medic, stated to the press. "They told us that as they were shopping, they were jumped upon suddenly by a terrorist, who stabbed them." "We gave them first aid at the scene and evacuated them to Hadassah Ein Kerem Medical Center in Jerusalem while fully conscious, with moderate injuries," Badarne continued. "The terrorist was shot in the limbs and treated there as well; he's in mild to moderate condition." Hadassah Medical Center representatives added just before 5:30 pm that two additional people had been admitted to Hadassah Hospital at Mount Scopus and are being treated for acute anxiety. Photos and some video of the attack - and its aftermath - have begun surfacing on social media. Ruti Dahan, 50, who works at a nearby kindergarten, was shopping at the supermarket when she heard three gunshots. "I turned around and I saw someone, who I suppose was the security guard, shouting 'Lie down, lie down'," she told AFP. She said that the presumed attacker tried to stand up after being shot but four people wrestled him to the ground. "For years I've been coming here twice a week to do my shopping," she said. "Now I think I'll switch to the Internet." Initial reports indicated that the attack was a shooting, but MDA medics and Channel 2 reported shortly after reports first aired that the attack was, in fact, a stabbing - and that the terrorist was not shot and killed, but merely injured. Meanwhile, Rami-Levy chain owner Rami Levy stated Wednesday night that the Mishor Adumim store will reopen shortly. "We will not let this affect us and change our routine," Levy stated. "We will prove to them that they will not beat us."